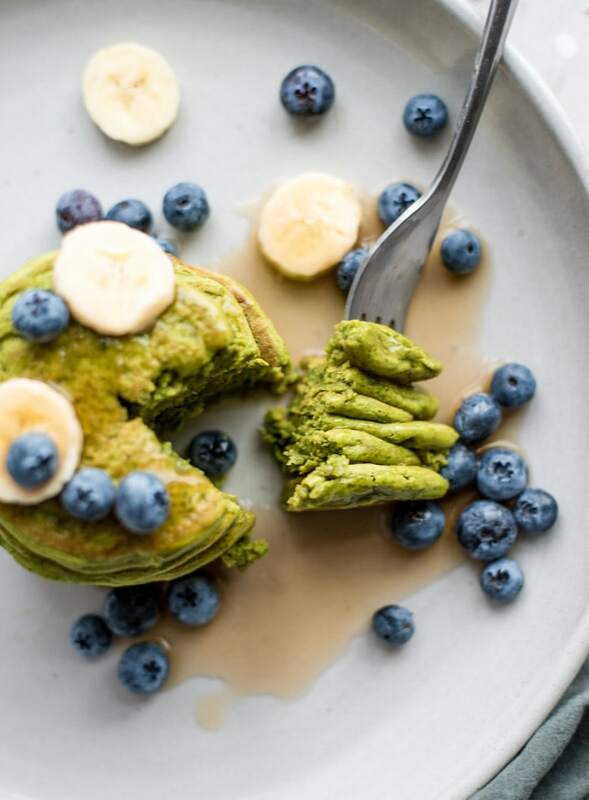 These green vegan gluten-free protein pancakes are made with chickpea flour, plant-based protein powder and spinach for a delicious and fun twist on everybody’s favourite breakfast. This recipe is very easy to make in a blender with just a few simple ingredients. 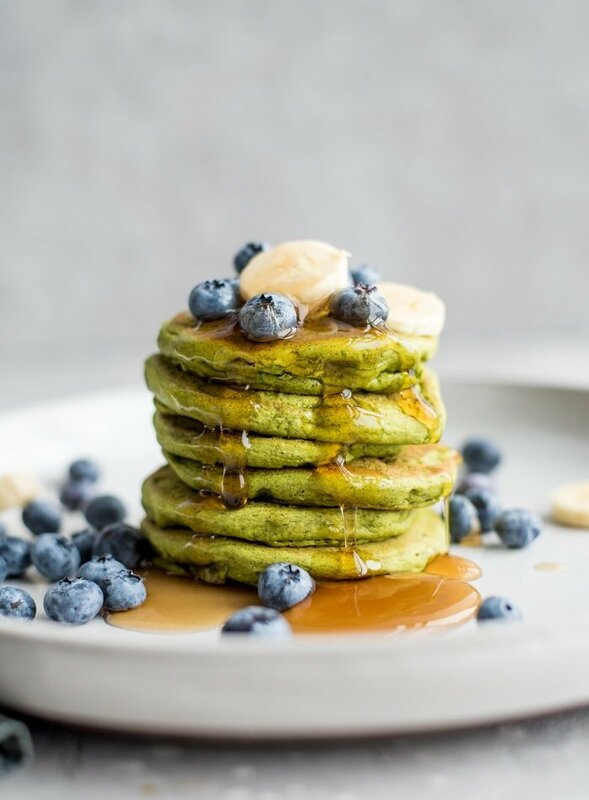 Top your green pancakes with pure maple syrup, almond butter and banana and enjoy. This recipe contains 34 grams of plant-based protein and 12 grams of fibre per serving! Chickpea flour, also called besan, gram flour or garbanzo bean flour is made simply from ground dried chickpeas. 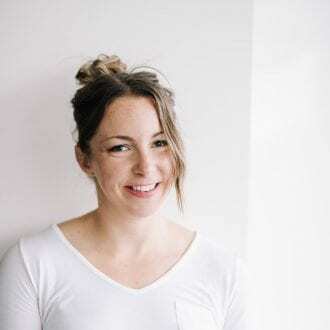 It’s super versatile and I use it often for everything from vegan omelettes to muffins and my favourite, pancakes. 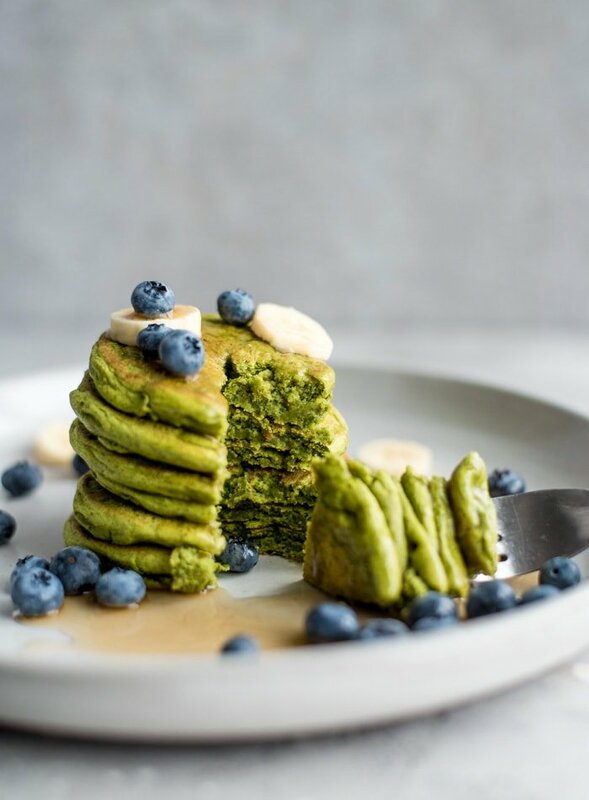 If you haven’t made my vegan chickpea flour pancakes and are looking for a vegan gluten-free pancake without protein powder that still has a good amount of protein, head over and check that recipe out. You basically only need 1 ingredient to make them. They’re that easy. I buy a generic organic chickpea flour made by my local natural food store but I’ve bought Bob’s Red Mill in the past and used it with success. They definitely vary brand by brand so you might have to experiment a couple times before you find one you like. You should be able to find chickpea flour in any well-stocked grocery store or natural food store. You can also buy it online here. Does chickpea flour taste like beans? Yes, when it’s raw. Well, I don’t know if it’s exactly bean-flavoured but uncooked chickpea flour definitely has a distinct flavour and smell. If you taste the raw batter and freak out, don’t worry, once cooked, that distinct flavour fades away and it’s delicious. I actually like the taste of it raw though so maybe you will too. Can I make my own chickpea flour? Yes! Personally, I just buy chickpea flour because it’s quite inexpensive but you can definitely make your own. You will need dried chickpeas and a fine mesh sieve to make it. Add the dried chickpeas to a food processor or high-powered blender and blend until they form a flour. Run it through the strainer and repeat a few times to get it as fine as possible. The finer the flour, the best the result when used in recipes. 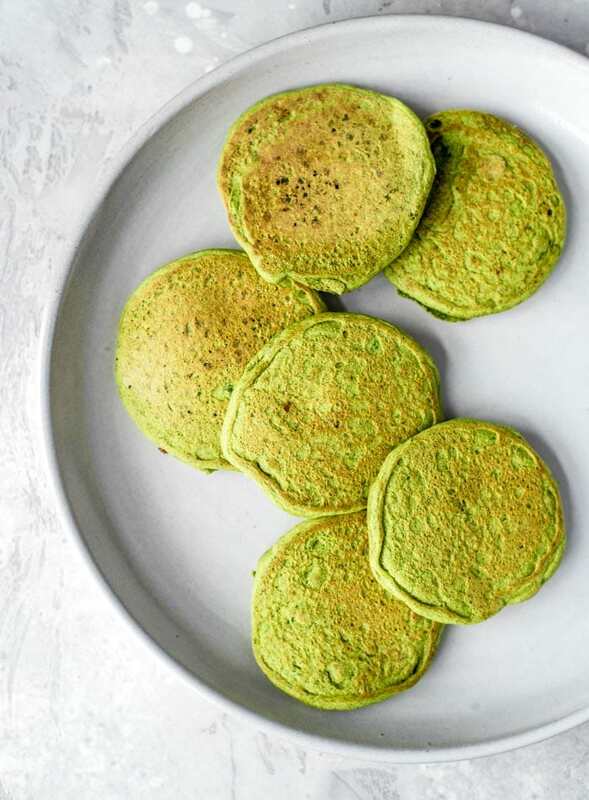 This spinach pancake recipe sneaks in some nutrition thanks to the big handful of fresh spinach that’s blended into the batter, and thanks to the magic of chickpea flour, these green pancakes are naturally gluten-free and grain-free. 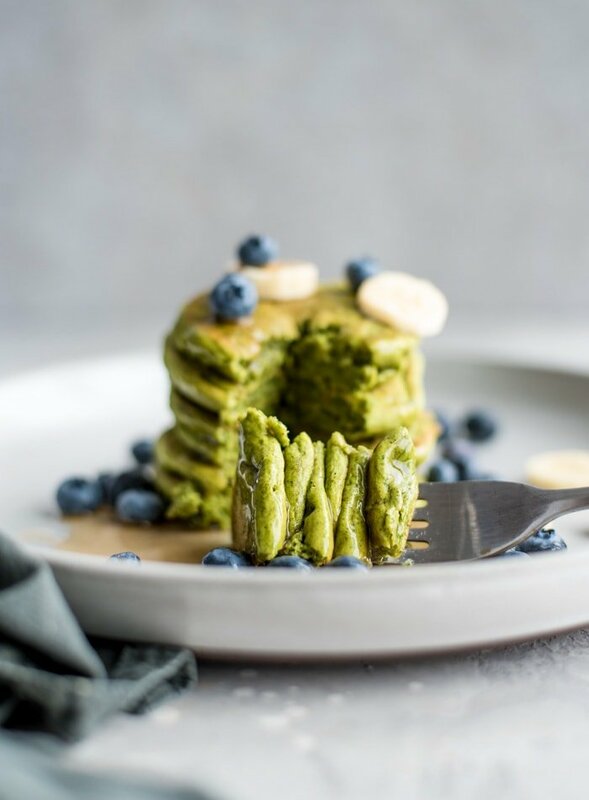 Add the vegan protein powder, you’ve got yourself a vegan protein pancake recipe that’s oil-free, sugar-free, low in fat and protein-rich. Make sure you don’t add too much water. 1/2 cup is the perfect amount. If you add to much they won’t be fluffy and they won’t cook as well. The recipe will still work if you add too much but they’ll be thin and a little on the mushy side. The batter should be quite thick, just barely pourable. If you do add to much water, you can always add a bit more chickpea flour 1 tbsp at at time to get back to a thicker consistency. Use a kitchen scale if you have one. For best results, I always recommend using a kitchen scale so you can measure ingredients accurately. If you don’t have one, that’s okay, just try to be as accurate as possible. You can get one on Amazon for about $15 and they’re super handy, especially if you do a lot of baking. Pre-heat the pan to medium-high heat. Let the batter rest for 5-10 minutes before cooking. The raw batter does not taste good but don’t worry, once cooked they taste great! This low-fat, high-fibre recipe makes 6 small or 3-4 larger pancakes for one. One serving provides 338 calories with grams of 43 carbohydrates, 34 grams of plant-based protein and 4 grams of fat. You’ll also be getting 12 grams of dietary fibre and 40% of your daily iron requirement. This recipe is also a good source of vitamin K, folate, phosphorus, zinc, copper and manganese. The nutrition details were calculated using stevia as the sweetener. If you use pure maple syrup or an unrefined sugar such as coconut sugar you’ll have to adjust for the additional carbohydrates. For more information on plant-based nutrition, read my vegan nutrition guide. 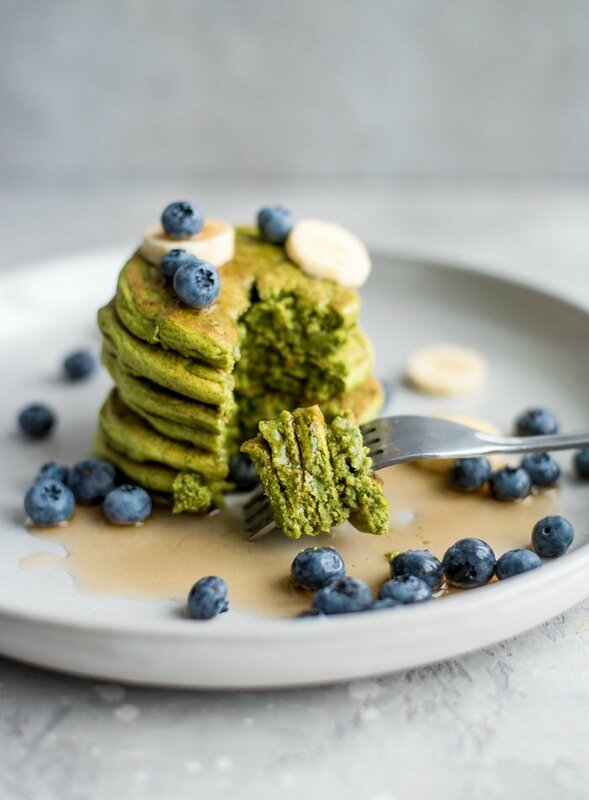 These fun green pancakes pack in 34 grams of plant-based protein and 12 grams of fibre per serving! 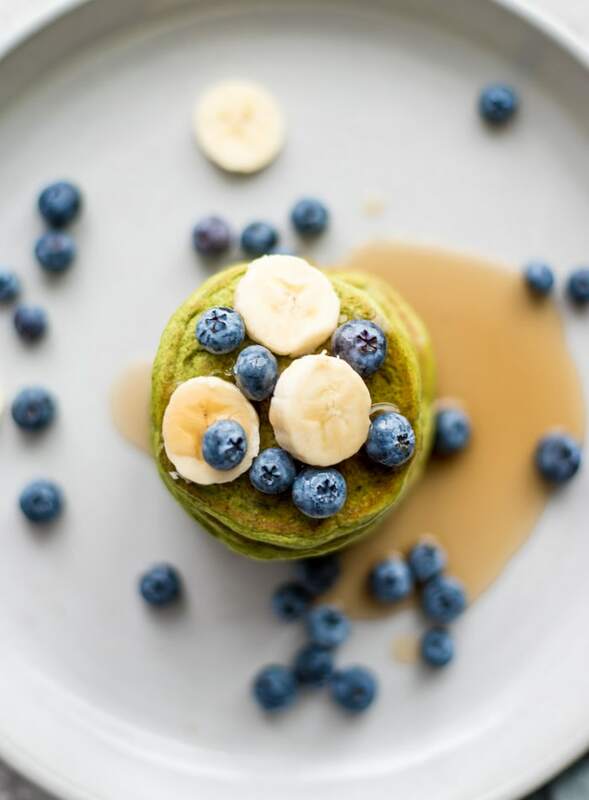 They’re easy to make in the blender, have a light, fluffy texture and taste amazing and are the perfect post-workout meal topped with blueberries and banana. Add all of the ingredients to a blender and mix until smooth. Be careful not to add too much water or they won’t be as fluffy or cook as well. Let the batter sit for 5-10 minutes. While it’s resting, heat a non-stick frying pan over medium-high heat. Spray the pan with some non-stick cooking spray then scoop the batter into the pan to form 6 small pancakes. You can vary the size if you want, it should make either 3 large pancakes, 4-5 medium ones or 6 small ones. Let them cook until there are some bubbles in the batter and they’re starting to look fluffy and cooked around the edges. Flip and cook for another couple of minutes. Love how much protein these contain!!! Ya! It’s pretty great! Such an easy way to get in some protein in the morning. Now those are some powerhouse pancakes! I bet they would be great savory for dinner too. I’ve never cooked with chickpea flour before! This really sounds delish! Can’t wait to try. I love chickpea flour! I use it for muffins, breads, cookies and of course pancakes. It’s so versatile for a gluten and grain-free baking option. Love it’s higher protein content too. These protein pancakes look so delicious! I’d love to start my day with these! Really nice, fluffy pancakes but the salt measurements seems a bit off, should it really be 1/2 tablespoon of sea salt? Sorry, where does it say tablespoon? It’s half a teaspoon! Sorry if I missed that somewhere. Could I use brown rice flour instead of chickpea flour? I think that should work but I haven’t tested it. They should cook up ok but I can’t guarantee the texture. Let me know if you try. I just tried it with brown rice flour. I also used a different protein powder and no spinach to make a white version. Overall they were very good! They were slightly grainier than I expected but other than that SUPER TASTY! Glad it worked out! Brown rice flour would definitely change the consistency and protein powders really vary in how grainy they are. Anyways – glad they worked for you! You can also check out my 4-ingredient protein pancakes for another good one!